It’s been a bad time for evidence-based argument. Now even the world of higher education policy, which one might have hoped would operate to tougher standards, is being dragged into the soup of unreason. Even the intelligent Andrew Adonis has been affected. 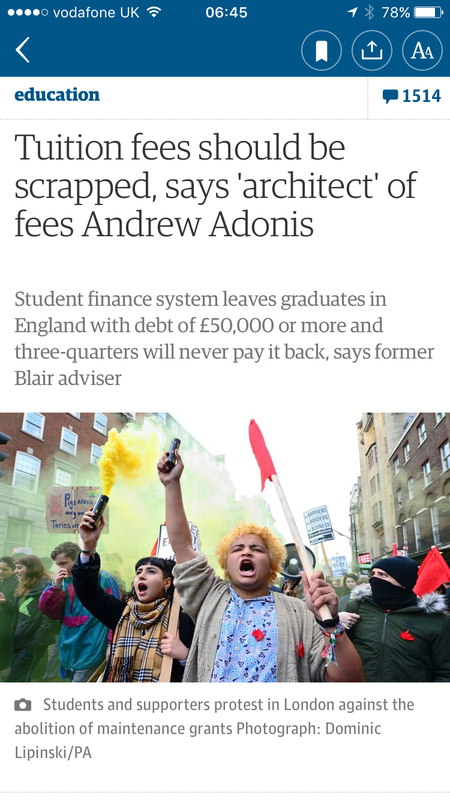 Adonis helped to create the tuition-fee regime, he says, and now he rejects it. That’s all fine; people have every right to change their minds, and it’s helpful for someone in his position to explain his thinking. But it’s a desperate pity that he so woefully misrepresents higher education in the process. Let’s consider some of his points. Hence graduates earning, say, £35,000 per year will pay back exactly the same amount per month, whether they owe £10,000 or £100,000. And after 30 years any remaining debt is cancelled. What Adonis presents as awful – that most graduates will never fully repay their loans – is in fact a basic principle of ongoing means-tested state support for higher education. There remain some powerful arguments to be made about the way the system has been manipulated. Increases to the rate of interest and a freeze of the threshold at which repayments are charged have worsened financial conditions for graduates. This does warrant scrutiny, but Adonis muddles arguments against the system’s operation and underlying principle. This is untrue in fact and based on a misunderstanding of the higher education market. Exeter was the first university in the country to declare that it would charge £9000. This decision was made independently, indeed with sensitivity to competition law. There was never anything resembling a cartel. But everyone – including vice-chancellors – failed at the time to grasp the peculiar logic of this market. I remember a meeting at which my own VC speculated that maybe 20-30 universities would be bold enough to charge £9000. I asked him why that number wouldn’t be significantly higher, and was politely dismissed as an associate dean’s naivety. Why did we get near-uniformity? Partly because the difference between £6000 and £9000, when it’s a payment long deferred, was not significant enough to affect students’ decisions. And partly because in this marketplace price became accepted as a proxy for quality. Degrees operate as positional goods: that’s something we all learned from the exercise. How many measurements of teaching quality do some people need? We’ve just come through the Teaching Excellence Framework, which demonstrated there is rather a lot of excellence around. Over the past decade or more the sector has adjusted to the scrutiny of the National Student Survey, the ‘key information sets’ of unistats, the entry of Which into higher education, and the unending pressures of league tables. In a series of tweets, subsequent to his Guardian piece, Adonis turned his attention to academic workloads, saying: a) we don’t teach enough; and b) we all have three months off in the summer. Any academic knows the latter assertion is wrong, but it’s also at odds with his claim that we’re obsessed with research. When does he think we do this? There’s always room for improvement, but this debate would be a bit more credible if we used the available evidence. That evidence simply does not support Adonis’s insulting and damaging assertions. And so, Adonis suggests, it was all the Tories’ fault. This ignores the fact that the Browne Review was commissioned in 2009 by a Labour government. Its recommendations were much more radical than the system that the Coalition government introduced. Browne proposed no cap on fees at all. So the Coalition government, rightly or wrongly, bottled it and set a maximum fee. That maximum fee, when charged, meant increased levels of income for universities, but Adonis joins other commentators in brushing one key point under the carpet. The higher cost to students was directly linked to a withdrawal of direct state funding. Some subjects continued to receive a much-reduced level of state funding; most now receive no direct state teaching funding at all. He might also have mentioned that there was never any provision for fees to rise in line with inflation. So the initial increase in income for universities has been followed by a series of real-terms decreases in income. And did vice-chancellors ever argue that they ‘needed even higher fees’? We might reasonably expect them to argue for higher levels of investment in higher education, since by international standards these were, and remain, worryingly low. But I’m not aware that any ever argued for higher fees, as opposed to direct state support. Indeed I know that many were unsettled – on practical and ethical grounds – by the proposals of Browne and the subsequent White Paper. Hence to Adonis’s proposals. As I understand his position, British universities should be allowed to recruit as many international students as they wish, and this will underwrite a ‘minimum’ level of home students. I may have misunderstood, but this seems so bonkers it’s hard to know where to begin. Firstly, he fails to acknowledge any extra cost to the state. That means he either imagines a brutal wave of austerity, or has no idea what it costs to run a university at any level of quality. Secondly, he assumes a virtually unlimited supply of international students (a business model, it’s worth noting, that Theresa May has derided as unsustainable). This ignores the international competition for such students, who are attracted to British universities – now – because of our strength and reputation. Thirdly, he suggests universities will take fewer home students than now, a shift that would almost certainly hit those from lower socio-economic groups. ‘why did we give university vice-chancellors a licence to print money … in a decade when austerity has dominated every other public service, including schools and hospitals? There’s the rub. Britain has a world-class university system, that punches above its weight on research and education metrics, attracts international students, and makes massive contributions to the economy and society. And yet this success invites some commentators to ask why higher education isn’t being sucked into the morass of austerity like other sectors. Well, Andrew, I’m sorry for our success. I’m sure there are ways you can find now to reshape universities in the image of austerity-Britain. None of this is intended as an argument in favour of fees (although I fully expect that it will be read as such). There’s no reason why we can’t have a high-quality, high-participation higher education system without fees. We just have to think seriously about what it costs and where that money will come from. Adonis doesn’t help. Objectivity is in the eye of the beholder; or not if we are being honest with ourselves. This blog reads less and less like an objective assessment of the situation in higher education and more as a cry for help, with an unsavory tone of Australian Pommy-bashing. Universities like Exeter have simply over-expanded, taken on too much debt, paid their VCs and growing army of administrators too much money, all to the detriment of the student experience. You should have stopped expanding ten years ago. In business, if your business model goes wrong, you go out of business. Since universities have been turned into businesses (something I believe the author of this blog understands to be a good thing), it is only right that they too should go out of business when they get things so dramatically wrong. That axe is looking pretty sharp!